Yep, that’s a shiny rock, alright. That Curiosity may have stumbled upon a meteorite isn’t shocking. The rover has sniffed out several such objects over the course of its travels, including a huge metal meteorite in 2015 and a shiny nickel-iron meteorite the following year. 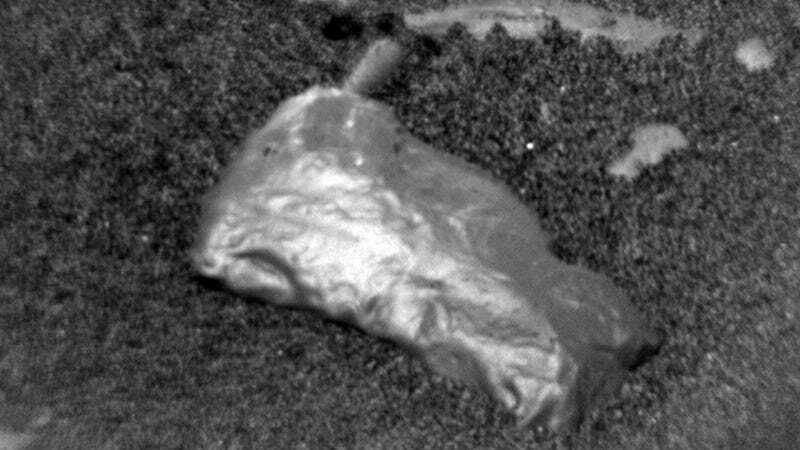 Other interesting objects discovered by Curiosity include a seemingly out-of-place shard, a smooth, oddly shaped object that turned out to be a piece of plastic wrapper that fell from the rover, and a perfect-looking sphere determined to be the product of a natural geological process called concretion. Perhaps the weirdest incident happened in 2013, when Curiosity spotted rocks that bore a startling resemblance to a squirrel—a classic example of pareidolia, a kind of optical illusion in which faces, animals, or everyday objects are projected onto insignificant stimuli or mediums. Rocks at the Highfield drill site. Anyhoo, the Curiosity rover will also investigate a rock called Flanders Moss, which earned its name owing to its dark-colored coating. Again, NASA won’t know more about this object until Curiosity analyzes a sample after drilling. Two other rocks, Forres and Eidon, will also be investigated before Curiosity bails on the Highfield site. Sadly, Curiosity is the only mobile rover on Mars at the moment. Its compatriot, the Opportunity rover, has been out of commission since a dust storm forced it into hibernation mode, a sleep from which it’s been unable to awaken. NASA hasn’t declared the mission dead just quite yet, but we should know more about the status of Opportunity early next year.